We’re working hard to release more UML diagrams. 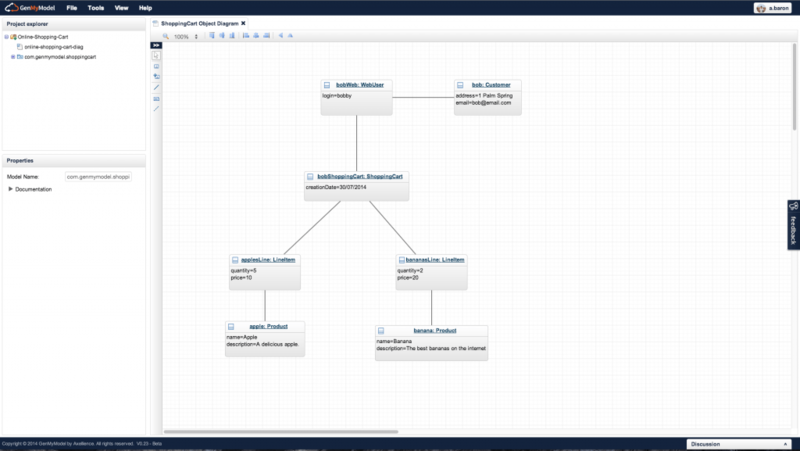 We are happy to announce that object diagrams are now available in GenMyModel. Based on the class diagram, the UML object diagram (formerly known as an instance diagram) shows a complete or partial view of the structure of a modeled system at a specific time or instant. The object diagram focuses on a particular set of objects (instances) and attributes in a class diagram, and the links between them. They also use almost the same notation as class diagrams. Instead of classes, the diagram uses “instances of classes”. These diagrams can be very useful in helping to understand a complex system or to explain to managers or customers what is going on in the system by providing an example. They may also be used for test cases of a class diagram. Have you tried to make an object diagram in GenMyModel? What do you think?